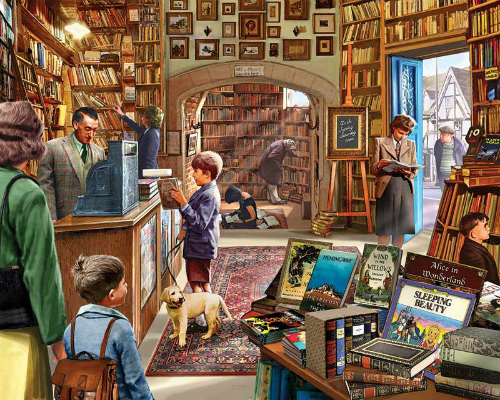 The Old Book Store jigsaw puzzle features a nostalgic scene from an English Village by artist Steve Crisp. What better way to spend an afternoon than in a comfortable old bookstore with sagging shelves and good company? Classic titles are piled wherever there's room in this jigsaw, and there's even a sign in the puzzle that there will be a book signing come Saturday - dogs welcome! Finished size is 24" x 30".